We are dedicated at Digatron to providing you with the information you need to get the most from your Digatron Data Acquisition System. If the following items do not answer your questions please contact us so that we may assist you. Click here to download the Troubleshooting Tips to print. Are your Instrument batteries low? Are the batteries installed correctly? If the displays, or backlight are dim or the unit shuts off check your batteries. To begin recording, the instrument must be in Monitor/Record mode, not Playback Mode. If you see a PRS or MEM annunciator in the display you are in Playback mode. Press the exit key, once or twice, to return to Monitor/Record Mode. Earlier version require you to exit Playback Mode. Current versions will automatically exit Playback Mode when they receive a tach signal. Earlier version... If your instrument comes on when the engine is started, but isnt recording, press the power button, the manual switch or pass a beacon and the instrument will begin recording. This usually happens when the engine starts briefly and then stalls. When the instrument is recording a colon will be flashing on the instrument display. When the Digatron instrument powers on it is displaying time in high resolution. The highest time that can be displayed in high resolution is 1:59.99. Once 1:59.99 is passed the 1 toggles on and off every two minutes. If your laps are longer than two minutes, press the two arrow keys simultaneously to change to low resolution. Your correct number of minutes will now be displayed and the numbers after the decimal point will be shifted off the display. You can return to high resolution by pressing the two arrow keys again. For instruments with the delay, dly feature, check that the seconds entered to ignore beacons (in setup mode) does not exceed your lap time. If you are not recording time segments, or laps, set the delay to .1. For the manual switch to trigger a lap on a 50 series instrument, all beacon codes must be set to None. See your set up instructions. Briggs & Stratton engines: B&S engines, and similar 4 cycles, have ignitions that produce weaker signals than other engines. To receive a strong enough signal with these ignitions, the antenna needs to be longer. The easiest way to do this is to spiral the colored wire (antenna) down the spark plug wire. 2-cycle engines: Generally strong signals are produced. Attaching the end of the tach sensor to the spark plug wire should be sufficient. If you experience low erratic tach readings see A. Instruments getting power and tach from the lighting coil: Make sure you hook the black wire of the power harness directly to the engine, and hook up the red wire with the fuse holder directly to output of lighting coil before the regulator. The power harness uses a ½ amp fuse. Be sure the power harness is connected to the connector on the back of the instrument. Loose sensor connections to the instrument can cause erratic or spiked readings. Placing a piece of tape on sensor connections can help ensure a strong connection. Broken and nicked sensors, and sensor wires, can cause erratic readings to all functions on the instrument. Replacing one or all of your sensors often solves the problem. Careful installation, and protection of sensor wires with plastic tubing, is essential. Damaged pigtail wires or sensors may give erratic readings, abnormally high readings, or a "00" reading. Keep your temperature and tachometer leads separated by at least 3 inches. Do not tie-wrap or tape leads together, as this can induce noise into the instrument. Route the leads as far away from the coil as possible. Install the tach lead on the plug wire at least 2 inches back from the plug boot. If you still have a problem, try a different location on the plug wire. Be sure that all sensors are connected to the instrument and that all connectors fit together snugly. If you are not using a temperature function, you need to use a shorting plug on that pigtail. Contact Digatron for shorting plugs if you will not use one or more of your temperature functions. If you are using an exhaust gas temperature sensor, make sure it is grounded. You can run your leads through separate sections of fuel line to protect them from cuts and abrasions, but it will not shield them from ignition noise. If your MPH or Jackshaft is erratic check the distance from the sensor to the collar (or selected trigger). An 1/8" or less is the ideal setting. Are the beacon batteries low? Is the beacon still on the track? Did someone remove it or turn it off? Check that your Digatron instrument is programmed to recognize the code the beacon is transmitting or that all codes are set to none and you are using the delay feature. Check your instrument setup instructions. Did you reconnect the beacon receiver to your instrument after downloading to your laptop? 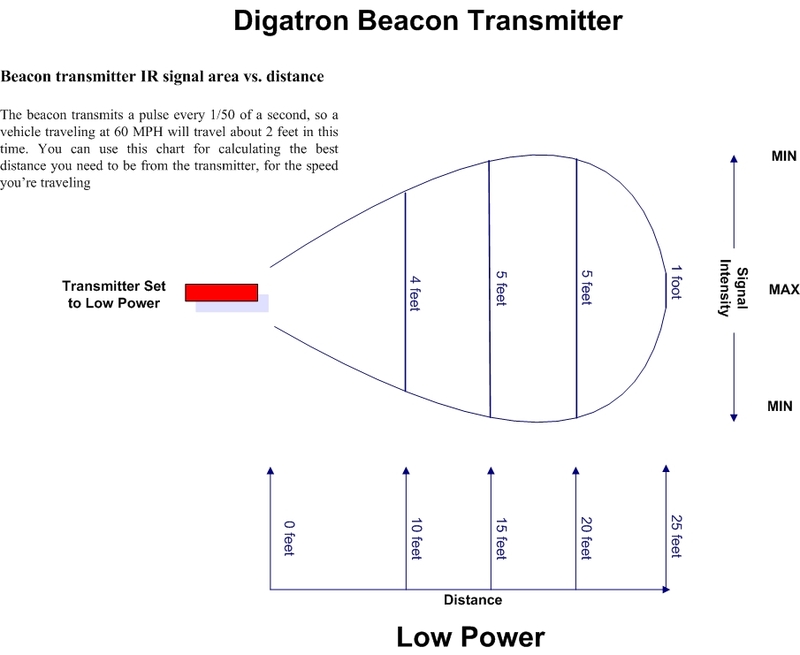 Is your beacon receiver pointed toward the beacon transmitter? Is the beacon receiver plugged into the correct connector on the back of the instrument? Attach the beacon receiver wire to the lap connector on the instrument and mount it on the vehicle so that the beacon signal has a clear path to the receiver. Have the beacon on standard power if it is within 10 to 25 feet of the instrument on the vehicle. Set the beacon on high power if over 25 feet from it. Standard power conserves batteries. Your vehicle should be at least 10 from the beacon transmitter on the track. Beacon signals are cone shaped and if you are too close to the beacon you may miss the signal or intermittently pick it up. The faster the kart the farther from the beacon transmitter it should be. This ensures the beacon receiver has time to pick up the beacon transmitter signal. The instrument has to be in the beacon transmitter field for at least 1/50th of a second to identify the code. See Diagrams below for a graphical representation of the Beacon signal. Beacon transmitters should be at least 25 apart. Beacon signals are cone shaped and can overlap if beacons are too close. This may cause the instrument to have trouble picking up a lap signal. For a safe distance apart, measure the distance from the kart to the beacon, and multiply by three. This is the recommended distance between beacons for consistent operation. Multiple short laps may be caused by multiple beacons on the track transmitting the same code your instrument is picking up. If you have a 50 series instrument change the code on your instrument and beacon or change the delay number in the instrument. If you have a 40 series instrument enter the number of seconds to ignore beacon signals after you pass the first one. See your setup instructions. Direct sunlight into the beacon receiver will reduce its sensitivity and can cause it to miss a lap. Make sure the receiver is installed with the overhang on top. If the rising or setting sun is pointed directly into the beacon receiver, set the beacon transmitter on high power. Please contact Digatron if you have questions on the above information or if you are still having problems after trying the above. 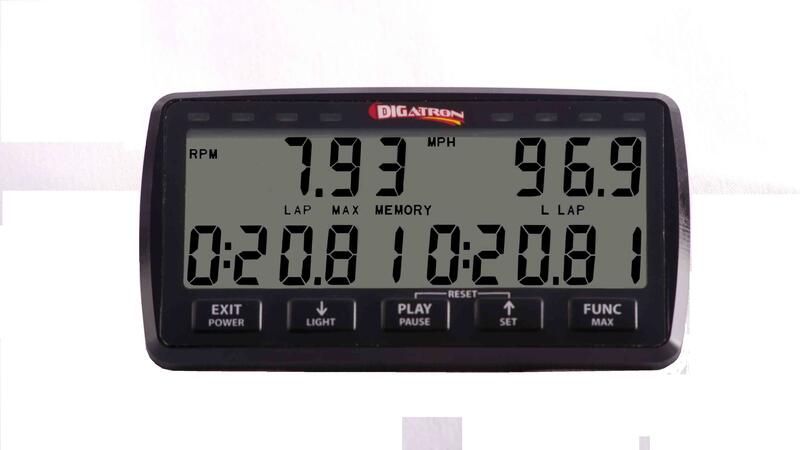 (509) 467-3128 of email us at info@digatronusa.com.